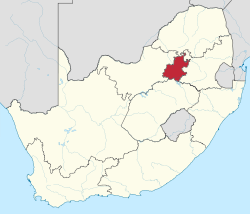 Gauteng (Inglis pronunciation: /ɡaʊˈtɛŋ/ or /xaʊˈtɛŋ/; Sotho pronunciation [xɑ́.ú.ˈtʼè.ŋ̀]) is ane o the nine provinces o Sooth Africae. It wis formit frae pairt o the auld Transvaal Province efter Sooth Africae's first aw-race elections on 27 Aprile 1994. It wis initially namit Pretoria-Witwatersrand-Vereeniging (or PWV) an wis renamit 'Gauteng' in December 1994. Situatit in the hert o the Highveld, Gauteng is the smawest province in Sooth Africae, wi anerlie 1.4% o the land aurie, but it is heichlie urbanised, containin the ceeties o Johannesburg an Pretoria. As o 2007[update], it haed a population of nearly 10.5 million, makin it the maist populous province in Sooth Africae. The name Gauteng comes frae the Sesotho wird meanin "Place o Gowd", the historical Sesotho name for Johannesburg an surroondin auries. This referred tae the thrivin gowd industry in the province follaein the 1886 discovery o gowd in Johannesburg. The Sesotho wird is a locative derived frae the Afrikaans goud (gowd) plus the locative suffix "-ng." When properly pronoonced, the first letter o the name Gauteng is a voiceless velar fricative, pronoonced similarly tae the "ch" in the German achtung or Scots loch. This pronunciation is naitural in baith the Sesotho an Afrikaans leids. ↑ 2007 population figure adjusted to account for the transfer of Merafong City from North West to Gauteng. ↑ Mid-year population estimates, 2011 (PDF) (Report). Statistics South Africa. 2011. Retrieved 1 March 2012. ↑ Merriam-Webster Online. They transcribe it /ˈɡaʊtɛŋ/, with the stress on the first syllable, but the audio file is /ɡaʊˈtɛŋ/, with the stress on the second; the latter more closely matches the Sotho. ↑ 8.0 8.1 "About Gauteng". Gauteng Provincial Government. Retrieved 2008-10-25. Wikimedia Commons haes media relatit tae Gauteng.